In this example you can learn how to send SMS messages and handle the delivery report through an installed API Extension. In this example you can learn how to send SMS messages and handle the delivery report through Ozeki Phone System XE and OPS SDK. First of all, please login and connect to the API Extension. After that, use the SendMessage method of the API Extension. dict["Message"] = "Hello, this is a test message!" result += "\r\nSMS successfully sent." First of all, configure your Request parameters. These are HTTP API commands. The HTTP API is an API available for the Ozeki Phone System XE that allows calls to be created, controlled and monitored, it also allows SMS messages to be sent. In this scenario the Commad must be „SendSMS” because we want to send a text message. (Check the command and the parameters of SendSms.) The ApiExtension parameter specifies which api extension is added to the command. The Sender is a phone number, the recipient will see as the sender and the Recipient is the destination phone number. The Message parameter is the content of the message. The SMS delivery report is sent to the adjusted URL as a notification. The Sender and the DeliveryReportURL are optional paramteres. 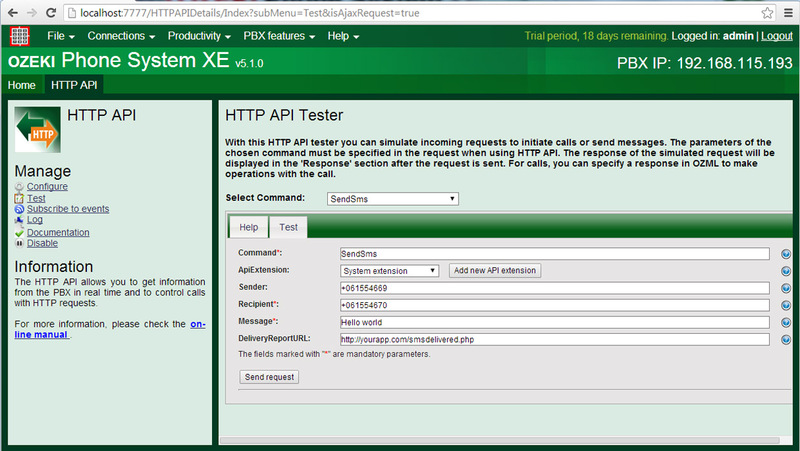 You can reach the same features in your Ozeki Phone System XE at the HTTP API section. Click on the Productivity menu point on the top of the screen and select the HTTP API option. Important to mention this is only a test interface and with this you can simulate incoming requests to initiate calls or send messages. With HTTP API Tester you can try all of the HTTP API commands and features. If you select the SendSMS command you can see the parameter settings (Command, APIExtension, Sendter etc.) what we set in the code earlier. And you can send a HTTP request, only need to click on the 'Send request' button to make it happen. If you would like to know more about the Ozeki Phone System XE HTTP API, click on this page. Please change the ozekixepbx.ip text to that ip address where the Ozeki Phone System XE is installed. On the yoursite.com the address should be that where the sample applications are running. After the configuration, make a HTTP Request with these values and send it to the API Extension. The API will send back a delivery report (if your SMS service provider supports it) to the given DeliveryReportURL. At the DeliveryReportURL it is possible to make another application that will handle the reports, for example log it into file. 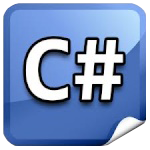 out_string += ",ReceiveDate " + receive_time + "\r\n"
Code example 2 - Handle delivery report. Create a new instance of OpsClient, and subscribe to the ErrorOccurred event. Your program will communicate with Ozeki Phone System XE through this client. Get the client to log into the running Ozeki Phone System XE by using the address of the server(ozekixepbx.ip) and a valid username and password. If you are ready, try to get an existing API Extension, with the GetApiExtension method of the OpsClient. Read more about installation of API Extension. When you are ready with the initial steps above, subscribe the MessageDelivered event of the the apiExtension. This event will trigger when the recipient has read the content of the message. In this example you can learn how to send SMS messages and handle the delivery report through Ozeki Phone System XE and OPS SDK. In the event handler you will get the ID of your sent SMS and the Result of SMS sending. The next step is sending the SMS itself. Please instantiate a new SMSMessage. The Recipient will be the first parameter of the constructor, the content of the SMS will be the second. (Every time when you instantiate a new SMSMessage, an ID will be generated in the instance of the SMSMessage. So if you store this ID, you can compare it with the Delivered messages.) After you finished the initialisation of the SMSMessage you can add it as the parameter of the apiExtension's SendSMS method, as you can see in Code Example 1.